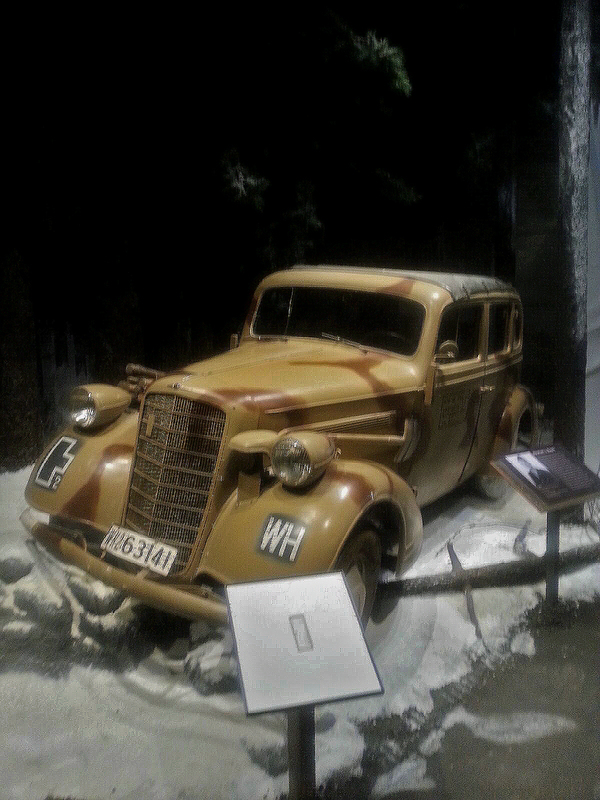 Opel Staff Car in Road to Berlin exhibit before winter camouflaging. Camouflage was a critical means of survival during World War II and as seasons changed and armies moved from theater to theater staying camouflage became a problem for many armies. During winter this was particularly an issue; vehicles painted green, grey, tan, brown, or black in a variety of patterns stood out in the white snows of Europe. As soon as the snow melted the newly-painted white tank would stick out even more and require another coat of paint. This resulted in a number of temporary solutions being invented. Bed sheets and other white linens could be used to make vehicle covers and ponchos for men, but this meant trying to acquire large quantities of linens which proved to be difficult in combat zones. Instead a simple solution was devised and used by nearly every army fighting in Europe, from the Finns in the north to the Russians in the East and the Americans and Germans in the west. Lime, easily acquired by burning limestone, was mixed with water to make whitewash. Whitewash was similar to plaster and was popular throughout the western world for painting exterior structures like fences. The wash was quickly daubed all over vehicles and after drying the car or tank would appear to be painted in white camouflage. The true genius of this solution was that when winter ended the vehicle did not require repainting. The mixture dissolved when rained on, and the white coat washed away to reveal the vehicle’s original color. This process saved a huge amount of time and resources; the whitewash could be applied in minutes and after washing away did not require the vehicle to be repainted when the weather warmed up. The National WWII Museum’s Road to Berlin features such a whitewashed vehicle in our Battle of the Bulge gallery. An Opel 6, painted in a brown and tan pattern, was chosen to illustrate the desperate state of the Nazi German mechanization during the war. Despite popular perceptions of the Nazi military as a highly modernized and mechanized force, vehicles were always in short supply. Civilian vehicles were often used to fill in as staff cars, ambulances, and courtier vehicles, including this Opel luxury sedan. This vehicle was whitewashed by Museum curators to demonstrate the technique used by soldiers throughout the war. The addition of blackout slits painted onto the vehicle’s headlights and branches to the top of the car would have made it nearly invisible from both the air and the ground. Opel Staff Car in Road to Berlin exhibit as it will appear to visitors in winter camouflage. This WWII camouflaging technique even has its benefits for this artifact. 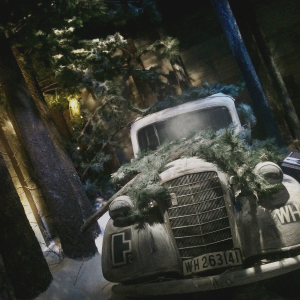 If the Opel is taken off of exhibit and needed elsewhere, the white color of the vehicle can easily be washed away. The entire process, takes only 20 minutes in addition to drying time. When the whitewash is first applied, it appears clear, but as it dries it becomes almost-solid white. The underlying camouflage pattern is scarcely visible, and helps to further break up the outline of the car. Simple modifications or additions such as this whitewashing are often used by museum staff to better illustrate conditions on the ground during the war. Visitors to the Museum can now see this staff car and learn more about the war in Europe in our exhibit The Road to Berlin. 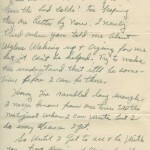 Post by Brandon Stephens, Curator at The National WWII Museum. As we continue our journey through The Road to Berlin, we stop next at the American Counterattack exhibit, which will highlight the extreme conditions faced by the Allies and the bold maneuvers they employed in order to defeat the German advances in the city of Bastogne. As US General George Patton mobilized three divisions to relieve the Allied troops, a sudden break in the harsh winter weather enabled essential air drops of supplies and offensive bomber missions to proceed. German forces were stunned and left vulnerable to Allied counterattacks. 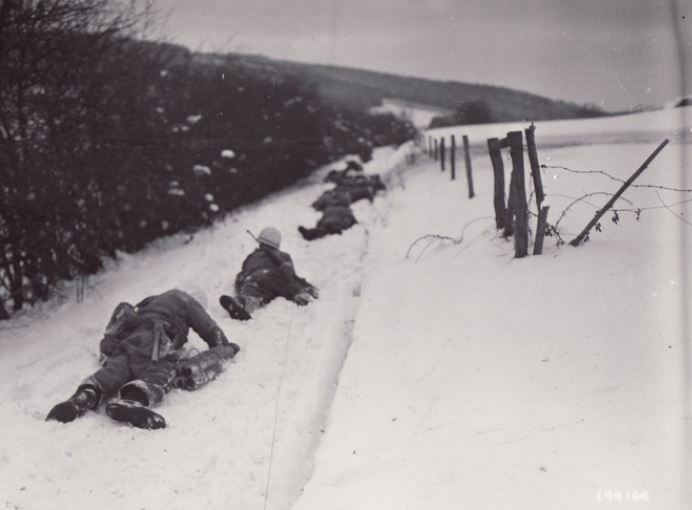 After the Siege of Bastogne, although the Allies continued to face harrowing conditions and setbacks as they marched closer to Germany, the Germans were quickly losing strength as well. The Allies rallied to the offensive in January 1945, reaching the Siegfried Line and breaking the final German resistance at the Battle of the Bulge. 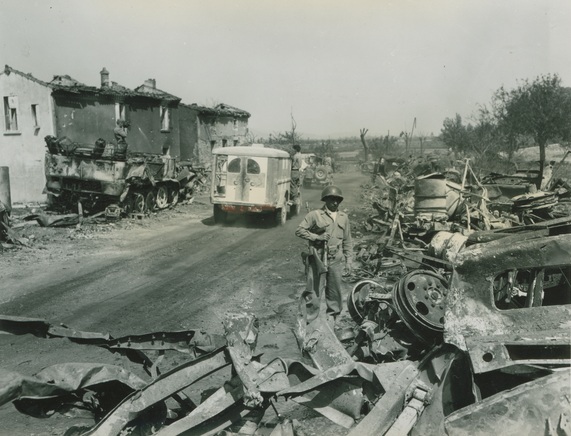 The American Counterattack exhibit will commemorate these events as the pivotal moment in overcoming German forces to advance to the final stages of the War in Europe. 2nd Infantry Division combat patrol members lie flat on the ground to escape enemy fire near Odenval, Belgium, 23rd Regiment. From the collection of The National WWII Museum. The American Counterattack exhibit has been made possible through a generous gift by Mr. and Mrs. Terrence Hall. As we move forward on our journey through the Road to Berlin, we stop next at the Siege of Bastogne exhibit within the Battle of the Bulge Gallery, which will focus on the significance of Bastogne as a vital crossroads town that would be crucial for either the Allies or Axis to advance, as it was a hub for several major roads in southeast Belgium. 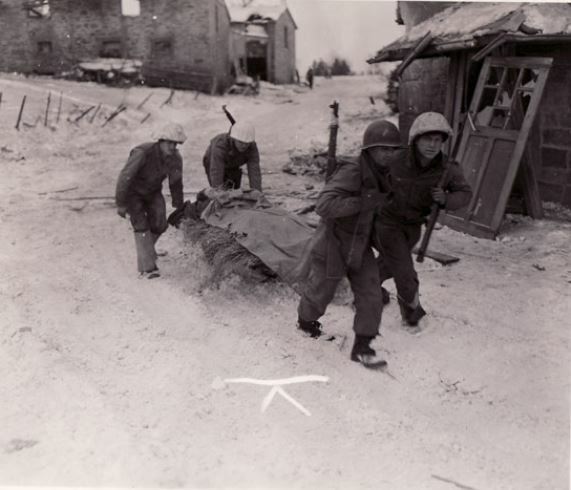 Men of the 30th Infantry Division carry a wounded German soldier to Battalion Aid Station in Thirimont, Belgium. Company B, 1st Battalion, 120th Regiment. Image courtesy of National Archives. With their eyes on Antwerp, the Germans were determined to gain control of Bastogne. They encircled the town and its resident Allied forces. 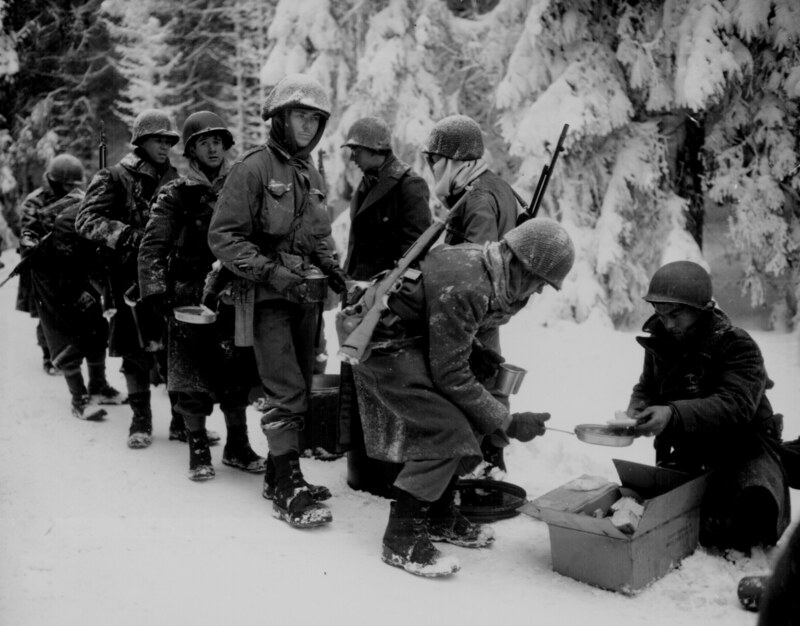 The beleaguered American troops, including the 101st Airborne, were running critically low on food and supplies and were vastly unprepared for the harsh European winter. Siege of Bastogne will feature defense tactics used by the Americans to fend off the Germans, and features the story of Medal of Honor recipient Staff Sergeant Archer Gammon, who died in the line of duty while singlehandedly defending against impending German attacks. Despite the adverse conditions, the Americans sustained their resistance until reinforcements arrived. 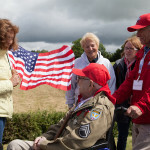 Commander McAuliffe’s refusal to surrender to at Bastogne remains a symbol of American resolve and the determination that was necessary to break the German stronghold. The Siege of Bastogne exhibit in the new Road to Berlin galleries has been made possible through a generous gift from Mr. and Mrs. Kenneth L. Blanchard Sr., in honor of Don Blanchard. 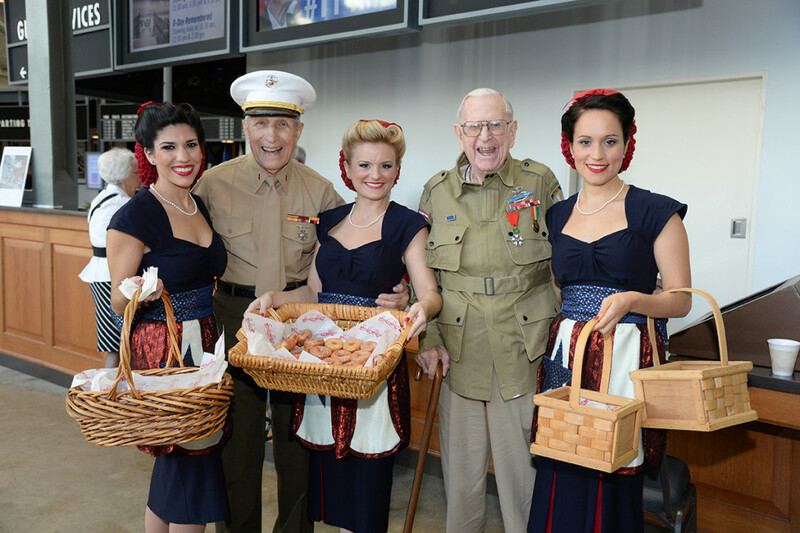 Kenneth Blanchard has been a supporter of The National WWII Museum since 2000. He first became involved through his company, Superior Energy Services, where he worked for 26 years before retiring in 2010. Superior is a major supporter of the Museum’s Road to Victory Capital Campaign, sponsoring the Voices of Courage oral history exhibit in the US Freedom Pavilion: The Boeing Center. 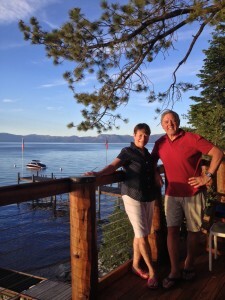 Ken and Jane Blanchard have attended several Museum events. 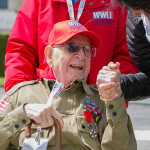 They usually have been accompanied by Ken’s father, Don Blanchard, who served in the 2nd Armored Division, known as “Hell on Wheels.” Blanchard states that when his father visits the Museum, he is often moved to tears by the “recognition of the sacrifices and service” given by so many from his generation. 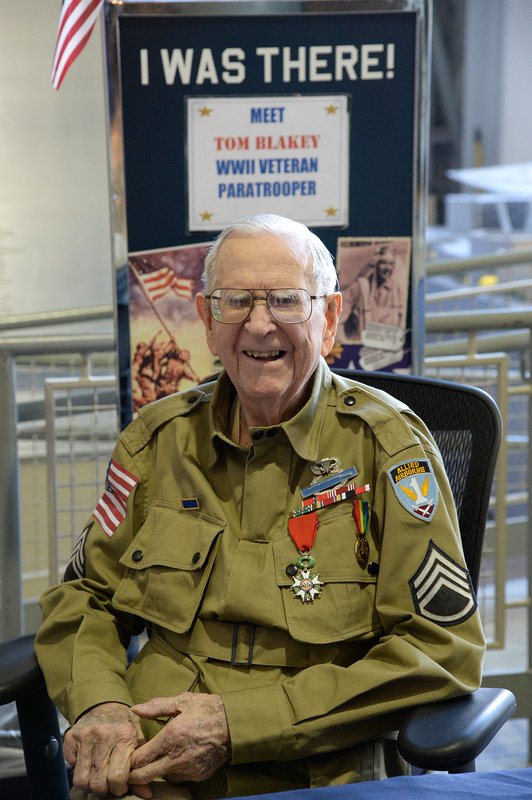 It was his father’s courage and bravery that inspired Ken Blanchard to name the Siege of Bastogne exhibit in the Battle of the Bulge gallery, an important feature in the new pavilion, Campaigns of Courage: European and Pacific Theaters. 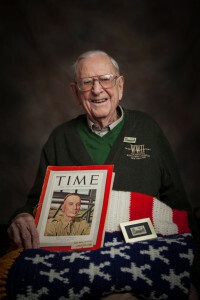 Don Blanchard fought in the historic battle and was in the siege in the winter of 1944. 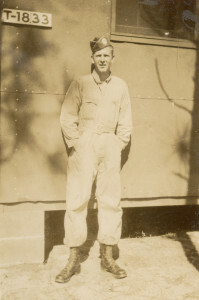 When Blanchard was growing up, his father never discussed the war. It wasn’t until his father visited the Museum for the first time that he began to open up about his involvement. 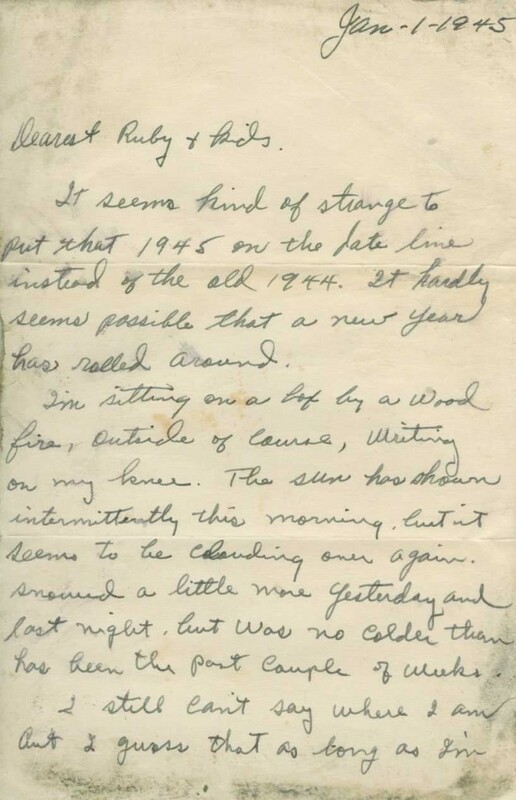 Ken pitched the idea of recording his oral history for the Museum archives, and recalls, “It was not an easy sell.” Don was eventually persuaded, and ever since, he has been more comfortable sharing his stories, including comments for a feature article for a Lafayette newspaper. Ken Blanchard asserts that the Museum is the “one of the best things to ever happen to the city of New Orleans, the state of Louisiana, and this area of the country” and that the Museum is “capturing and presenting in a very unique and very professional way” one of the most important events in modern world history. He is particularly moved by veteran volunteers at the institution. Their dedication to the Museum and desire to help visitors is inspiring. 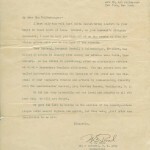 The volunteers also have made it easier for his father to feel comfortable discussing his role in the war effort. Blanchard states that it is important to invest in the expansion of The National WWII Museum, whether that investment comes in the form of time or gifts. He said the Museum is particularly effective at telling the war story in an interactive way, immersing visitors in a decisive time in history. As we continue our journey through the Battle of the Bulge gallery inside the Road to Berlin, we stop next at the Surprise Attack exhibit. This exhibit focuses on the initial response of the Allied Forces from the surprise German attack during the winter of 1944-45 through oral history stations, artifacts, and content panels. From there, we then move on to the North Shoulder exhibit, which through an in-depth examination of military response, will honor the soldiers who fought and were ultimately victorious at Elsenborn Ridge. 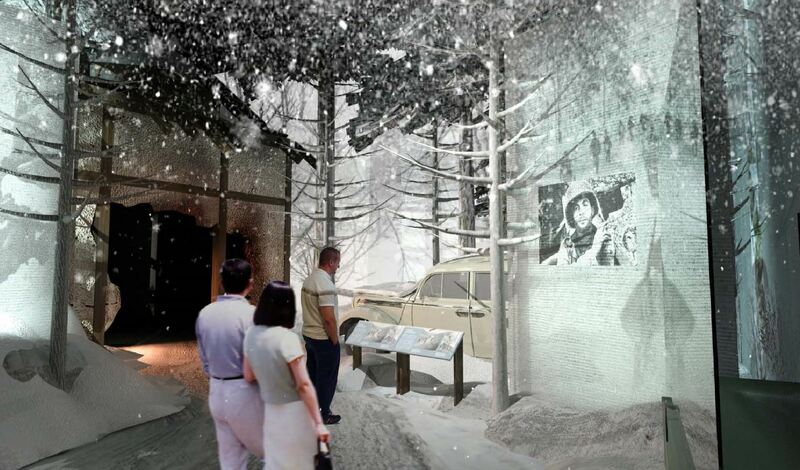 This exhibit will explain the strategy behind Hitler’s counterattack during the winter of 1944-45 and the initial response of the Allied Forces. Hitler planned to break through a weak spot in the Allied lines, occupied by only three divisions, in a drive to Antwerp, Belgium, splitting the British army to the north and American forces to the south. The operation was Hitler’s last desperate attempt to turn the tide of the war. The Germans hoped the element of surprise, the dense forest terrain of the Ardennes, and the harsh weather conditions would all work to their advantage – and their efforts were initially successful. Many American units were surrounded and, in some cases, entire regiments surrendered. Though the Allied forces rallied in time to prevent disaster, and would eventually achieve victory, Surprise Attack will show that Germany remained still a capable and dangerous enemy. This exhibit will cover American defenses against the German assault in key locations along the northern shoulder of the Battle of the Bulge. 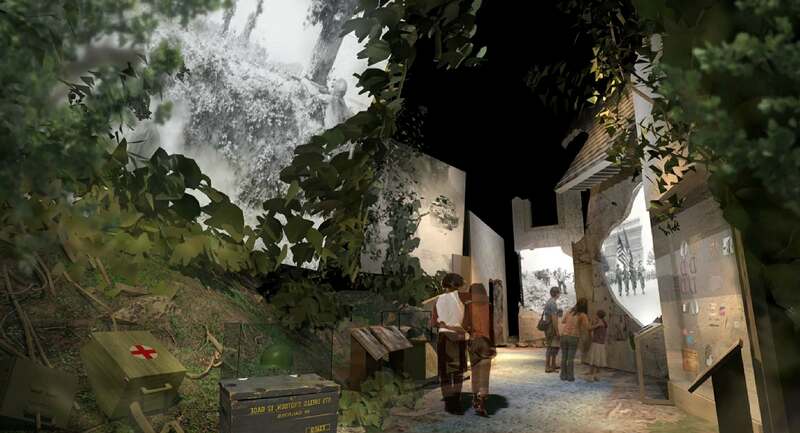 The exhibit will provide an in-depth examination of the military action at Elsenborn Ridge, where the 1st, 2nd, and 99th Army Divisions played a pivotal role. Although the Germans possessed superior armor, they were held in check by innovative American tactics including coordinated time on target artillery strikes, new proximity fuses for artillery shells, and more advanced air power. Both sides suffered many casualties. Ultimately, the German troops were unable to break through American lines at Elsenborn Ridge. The exhibit will also focus on three towns: Stavelot, La Gleize and Stoumont. The North Shoulder exhibit will honor the soldiers who fought here and show that their valiant efforts were crucial to American victory. 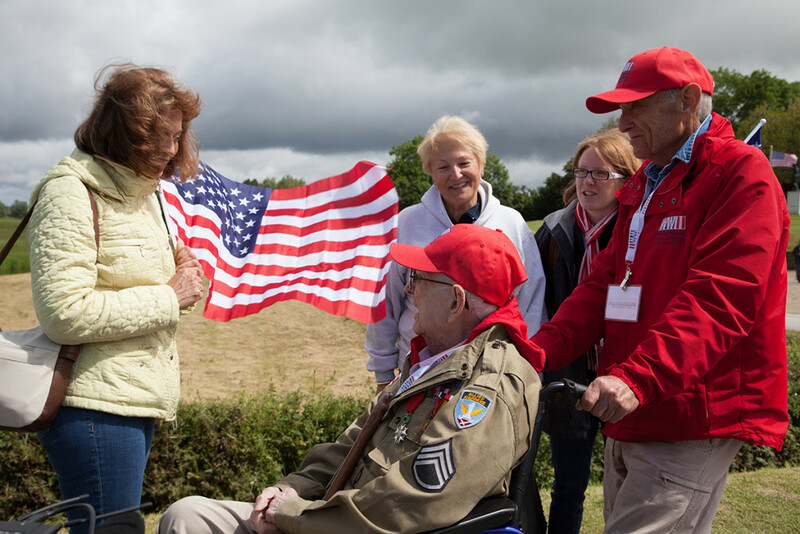 As we continue our journey through The Road to Berlin, we stop next at what will be an extraordinary immersive gallery space, the month-long Battle of the Bulge – the US Army’s largest battle of World War II. 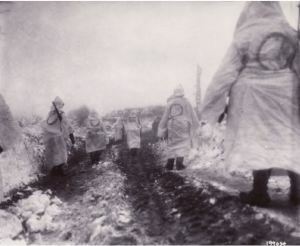 Grappling with bitterly cold weather, more than 30 divisions and 600,000 men fought desperately to halt the Germans after the surprise assault in December 1944. 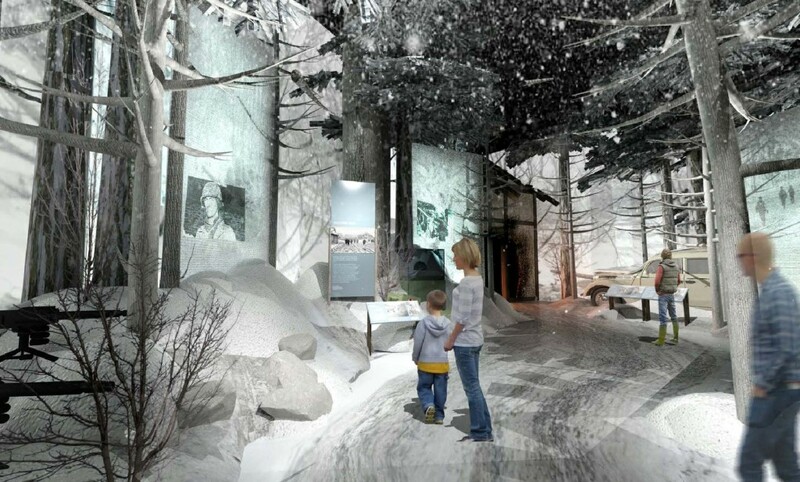 Walking through the gallery, you will be surrounded by the dense, snow-covered Ardennes forest, with projections of soldiers and battle scenes partially visible through the trees, allowing you to sense the extreme environmental conditions that made this battle one of the most difficult of the war. Oral history stations, artifacts, and content panels will guide you from the surprise German attack to the Siege, to the ultimate hard-won Allied victory. Finally, you will join the Allies as they push through the German border and write the final chapter in the war in Europe – the fall of the Third Reich. The Battle of the Bulge gallery has been made possible through a generous gift from The Starr Foundation. 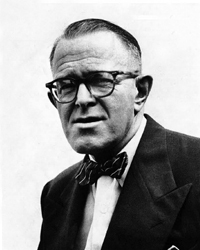 The Foundation was established in 1955 by Cornelius Vander Starr, who served in the US Army during WWI. 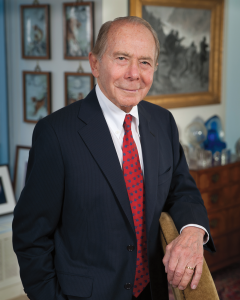 He died in 1968 at the age of 76, leaving his estate to the Foundation, and he named his business partners – Ernest E. Stempel, John J. Roberts, Houghton Freeman, and Maurice R. “Hank” Greenberg – to run the foundation under Greenberg’s leadership. 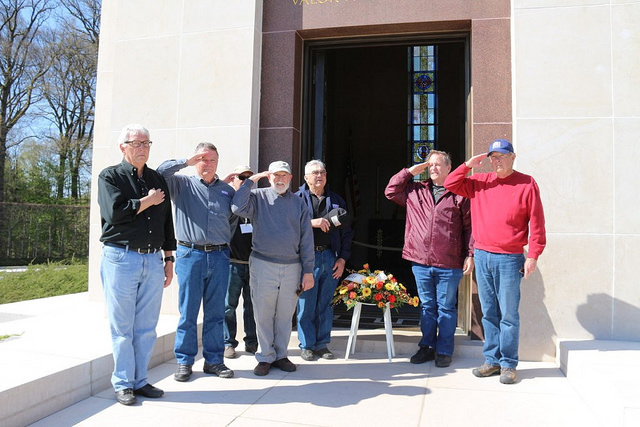 The partners were all WWII veterans: Stempel, Roberts, and Freeman all served in the Navy in the Pacific and Greenberg served in the Army in Europe. 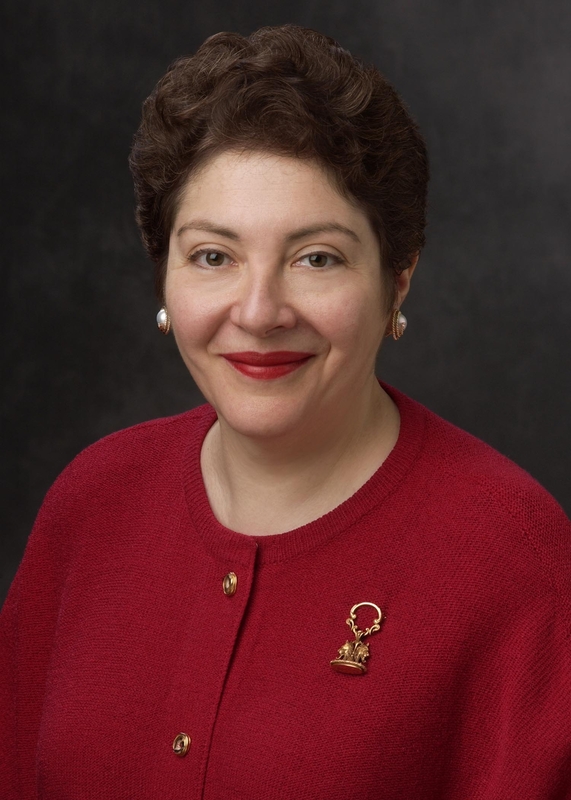 Florence A. Davis, President of The Starr Foundation, remembers when Museum founder Stephen Ambrose first met Greenberg in 2001. 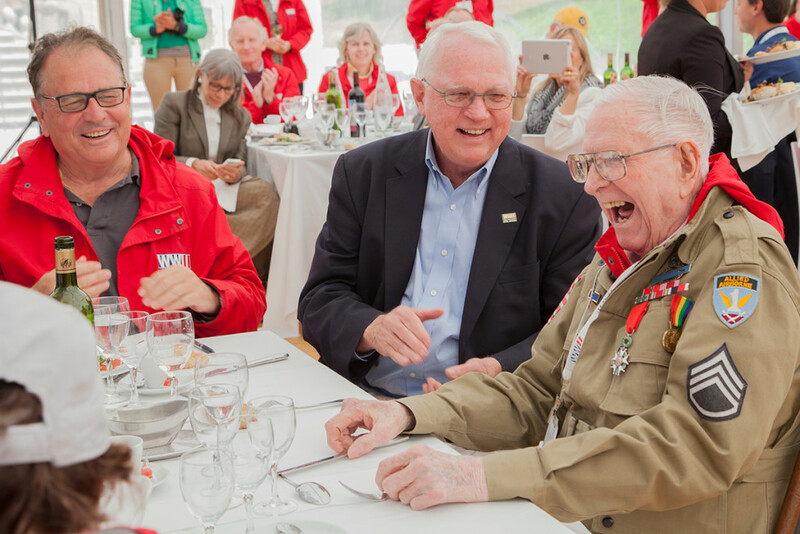 Tom Brokaw arranged the meeting and shortly thereafter The Starr Foundation awarded the Museum a $1 million grant in support of the institution then known as The National D-Day Museum. During this time the Museum was also building out its D-Days of the Pacific galleries within the Louisiana Memorial Pavilion. The Foundation chose to name the Introduction Gallery to honor the service of The Starr Foundation directors, particularly the three that served in the Pacific. 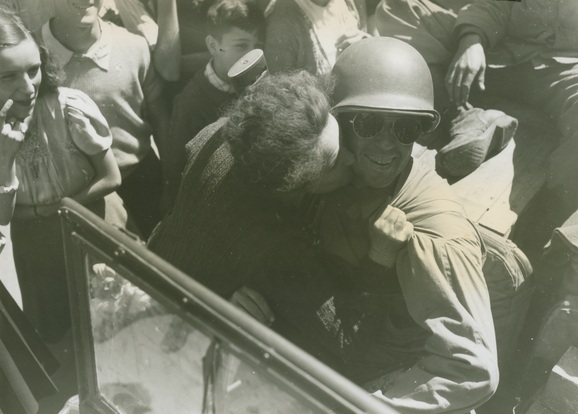 Eager to dedicate a space that would preserve the story of the European Theater in Greenberg’s honor, The Starr Foundation generously provided an additional gift in 2010 in support of the Museum’s Road to Victory Capital Campaign to name the Battle of the Bulge gallery. Davis first visited the Museum in late 2001, soon after the attacks on 9/11, and she recalled the Museum was “a good reminder of the ideals that Americans fought for in the past and what we continue to fight for today.” Her late father also served in the Navy from 1944 to 1946. 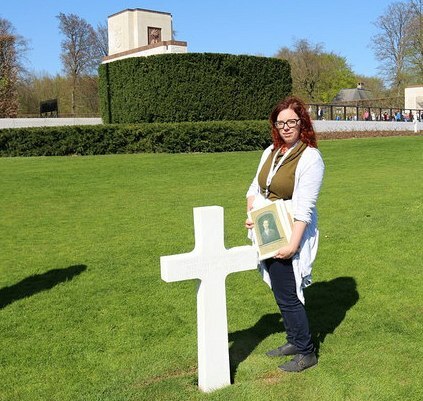 He passed away when she was young and, as it has for so many others, the Museum provided her an indirect way to learn about his experiences and life during the war. The Museum’s growth and impact can be attributed in part to The Starr Foundation’s tremendous support of the Museum’s capital expansion. We feel privileged to honor the service of The Starr Foundation’s directors, a group of heroes whose service and sacrifice preserved the freedoms we have today. The Museum is grateful for the Foundation’s support and for the leadership of Greenberg and Davis, who have played key roles in developing the Museum into a world-class institution. 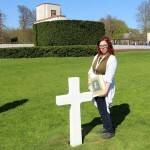 Post by Katie DeBruhl, Donor Relations Coordinator at The National WWII Museum. In last week’s blog post of the Road to Berlin countdown, you learned about the story of the story of the Allies experiences in France in WWII in the Northern Europe: Breakout and Liberation gallery. This week, let’s explore the content of the gallery’s first two exhibits: Pushing Beyond the Beachhead and Race Across France. 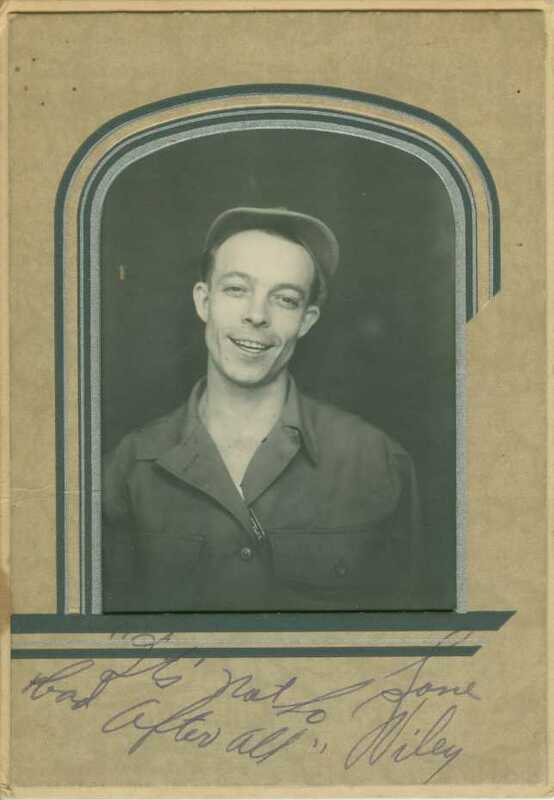 You will also learn the story of Frank Denius, a WWII veteran who, along with the Cain Foundation, has generously sponsored the Race Across France exhibit In Honor of The Men of The 30th Infantry Division. This exhibit will explore the many unexpected obstacles that the Allies faced as they moved inland into France. The British and Canadian forces attempted to advance from Gold, Sword, and Juno beaches, but were stalled by fierce enemy resistance outside Caen. At the same time American forces were struggling through the bocage, a region of compact fields and tall, dense hedgerows that proved ideal defensive terrain for the Germans. Pushing Beyond the Beachhead will convey how the Allies still faced a deadly fight in the weeks after D-Day, and how they slowly advanced forward to the port of Cherbourg and the town of Saint-Lô through grim determination. 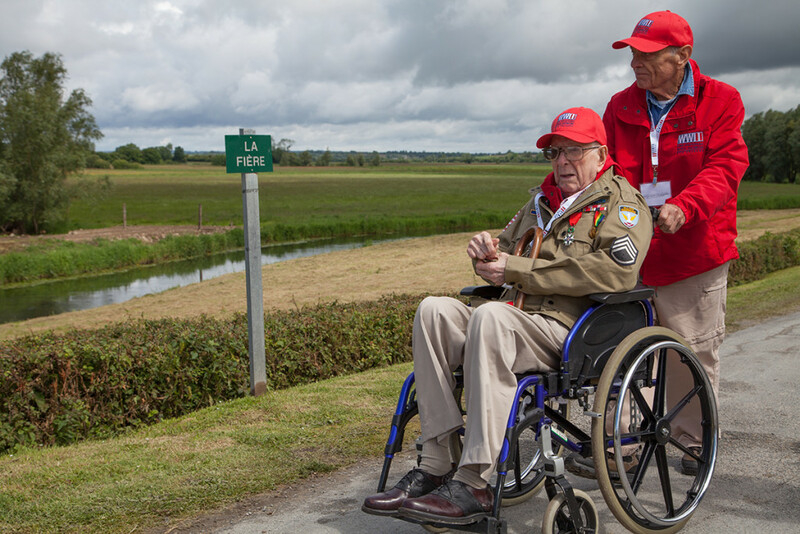 Race Across France will tell the story of how American forces battled for weeks to break through the Normandy hedgerows before launching Operation Cobra on July 25, 1944. Allied bombers took advantage of our air superiority in a massive strike that hit some of our own troops but also paralyzed the German defenders, allowing American troops to suddenly punch through the German lines near Saint-Lô and overwhelm the stunned enemy. General George Patton’s Third Army spearheaded the race across the French countryside, determined to encircle the rapidly retreating enemy in the pocket at Falaise. The exhibit will convey the resolution of the Allied Forces as units poured through the opening, broke out into the open terrain, and doggedly closed in on the Germans through fierce fighting. 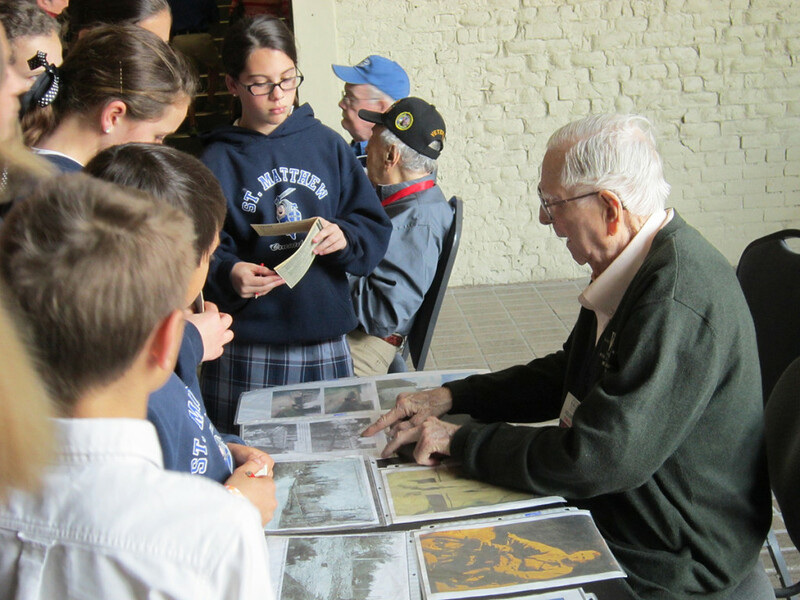 The Race Across France exhibit has been made possible through a generous gift from Frank Denius and the Cain Foundation In Honor of The Men of The 30th Infantry Division. Franklin W. Denius spent his childhood in the small town of Athens, Texas. As a teenager he attended a military prep school, Schreiner Institute in Kerrville, and then at the age of 17 he enrolled at the Citadel in Charleston, South Carolina (under the U.S. Army’s educational program). 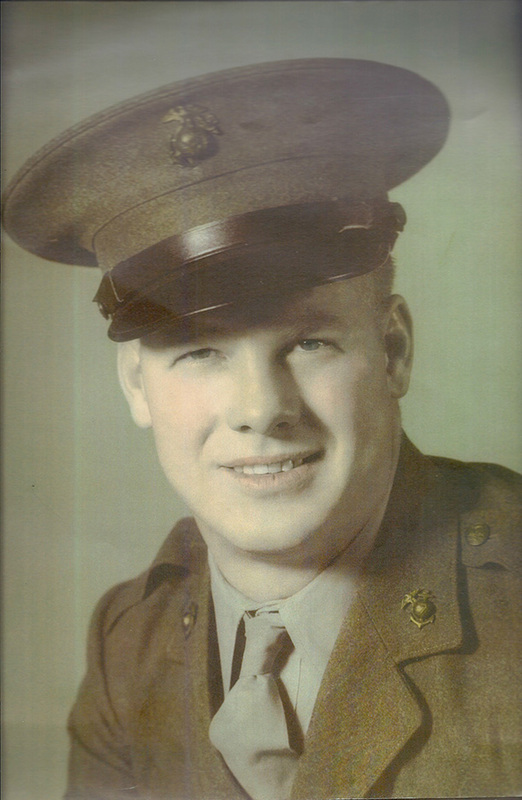 Within a year, he entered active duty on June 3, 1943. 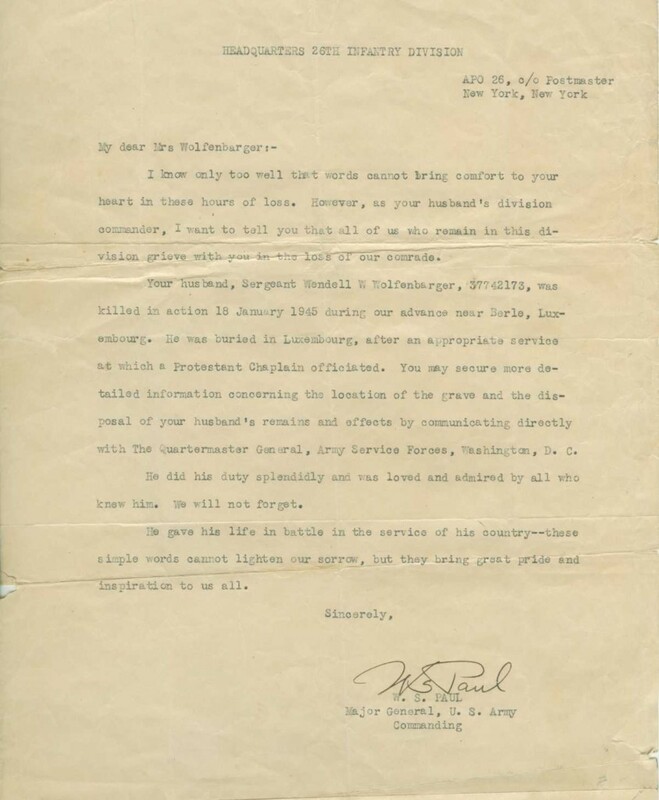 After training as a forward artillery observer, an especially dangerous job that required operating between friendly and enemy lines, he was assigned to the 30th Old Hickory Infantry Division. 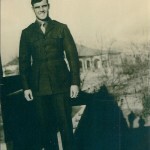 Frank arrived in England in February 1944. On June 7, 1944, his unit waded ashore at Omaha Beach and went into action providing fire support for the 29th Infantry Division for six days, then his artillery battalion returned in support of the 30th Division. On July 17, 1944, his observer party came under enemy fire, and his commanding officer was killed. He took command of the situation and began calling in fire, and the 30th Infantry Division overcame the German opposition. 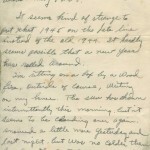 In August, he found himself and 700 other men surrounded by a German counter-offensive designed to split Allied forces. For six days, they resisted the German counterattack from atop Hill 314 during the Battle of Mortain. He was calling fire missions almost non-stop for 72 hours and stopped the Germans. When they were finally relieved only 376 of the men came down that hill, as roughly half the American defenders were killed or wounded. 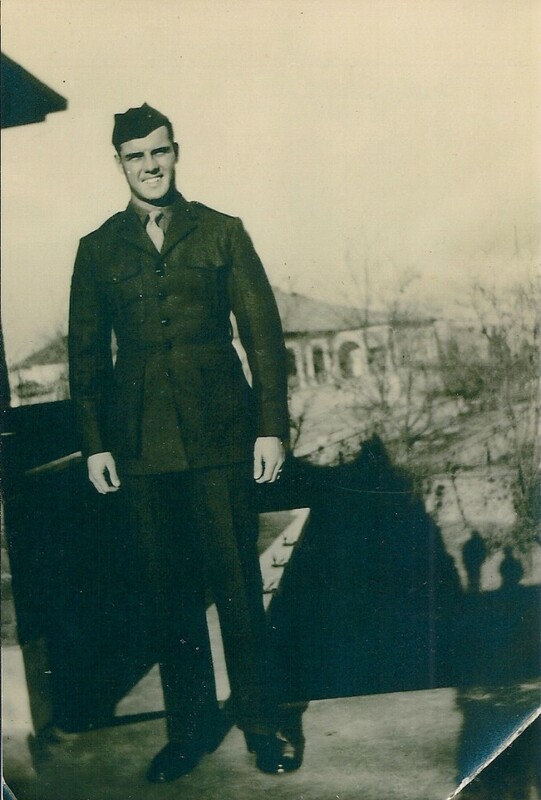 In December 1944, Frank’s unit was in Belgium during the Battle of the Bulge and found itself in the path of another German offensive. 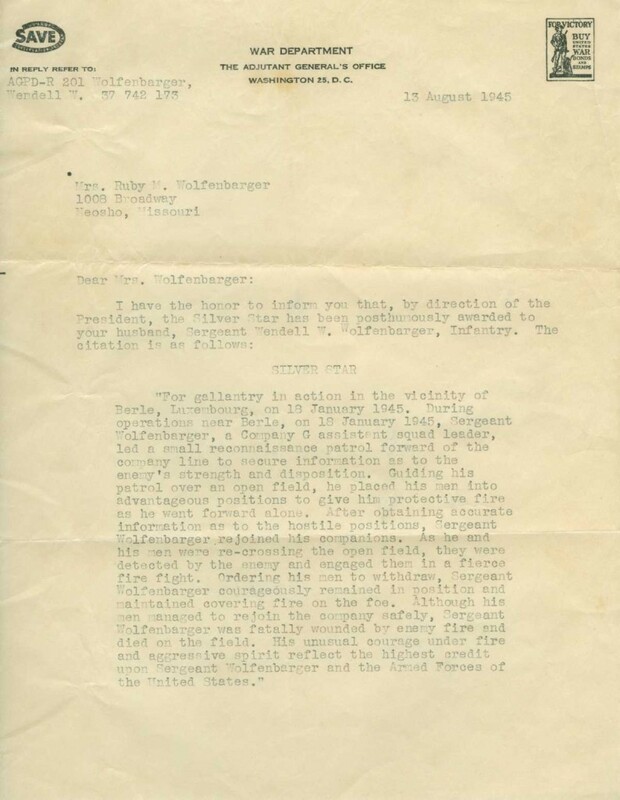 Frank said he disobeyed an order to withdraw, and began calling for fire that repelled a German Panzer attack. Although wounded by German rocket fire on January 25, 1945, he fought through Germany until VE-Day and came home in August 1945. 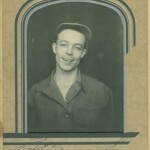 Frank fondly remembers returning home from the War as an honored member of the 30th Division on the Queen Mary, enjoying a private room with a real bed and a working shower. 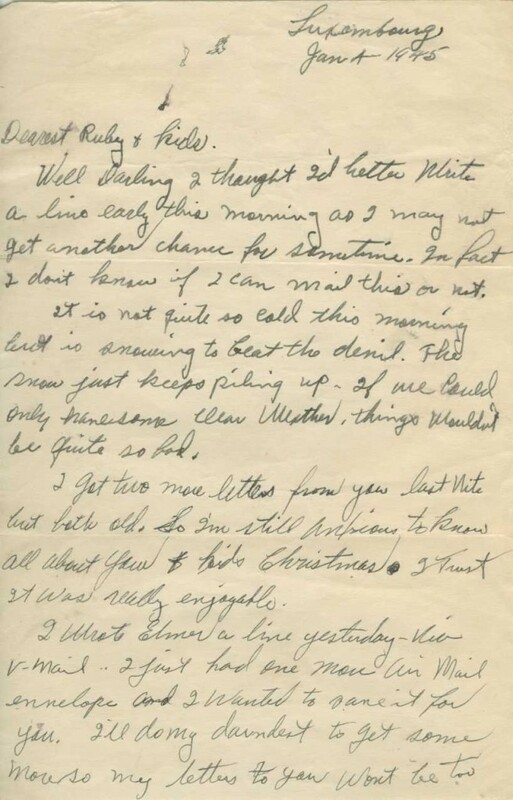 He then returned to Texas and was discharged in San Antonio at Fort Sam Houston on October 2, 1945. 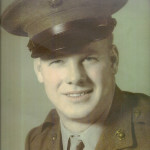 He has been awarded the Purple Heart twice and the Silver Star a total of four times. 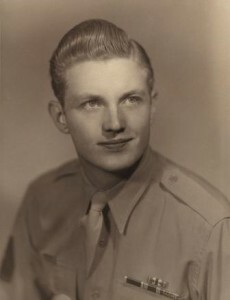 While some of his medals were awarded in public ceremonies in France, in 1954 he recalls “receiving a box full of medals from the Department of Defense at my doorstep that I did not even know I had received.” Through the GI Bill he was able to attend the University of Texas and earned degrees in business and law. 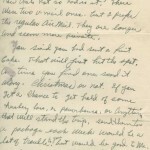 Frank’s first contact with The National WWII Museum came through the newspaper. He was told there was an article in the newspaper about Andrew Higgins, who manufactured the boats that Frank had used to land on the Normandy beaches. 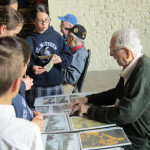 He read the article and learned more about the location of the Higgins factories and that New Orleans was a natural site for what was then the National D-Day Museum. In the mid 1990s, Frank attended a lecture by Museum co-founder Stephen Ambrose at the University of Texas campus, in which the historian discussed D-Day and the campaign to build the Museum. We are very thankful that Frank and the Cain Foundation chose to honor the 30th Infantry Division through a gift to The National WWII Museum. 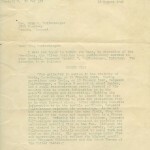 Frank wants those men “to be forever acknowledged for their tremendous roles in the battles they fought. The 30th Infantry Division deserves the recognition for their service in WWII for all generations to come. Every generation of Americans will have to pay a price for freedom, and the 30th is a good illustration of the price that those guys paid in their generation.” His regiment was nominated for a presidential citation for its exemplary service during the Allied advance, including a vital role in all five major battles of the European Theater: Normandy, Northern France, Central Europe, Ardennes/the Battle of the Bulge, and Rhineland, Germany. We are privileged at the Museum to be able to honor the 30th Division in the Race Across France exhibit within Campaigns of Courage: European and Pacific Theaters and benefit from the Cain Foundation’s generous support. We are thankful for the partnership of Frank Denius and the Cain Foundation in honoring the Citizen soldier and preserving the story of the 30th Infantry Division for generations to come. Next Up- The remaining exhibits within the Northern Europe: Breakout and Liberation gallery and the story of the donor who generously supported them, the Collins C. Diboll Private Foundation. Post by Lauren Bevis, Donor Relations Manager, and Ashley Nash, Prospect Coordinator. In our last blog post of the Road to Berlin countdown, we covered the D-Day Theater and D-Day Beach exhibit. Now, we examine the story of the Allies experiences in France through Northern Europe: Breakout and Liberation, followed by a spotlight on our donors that have generously sponsored this important gallery. The breaching of Hitler’s Atlantic Wall and establishment of a secure beachhead in Normandy was followed by a campaign of dramatic highs and lows, wins, and losses. After battling German troops in the hedgerow country and Normandy’s coastal towns, Allied forces broke through enemy lines and raced across France. 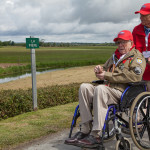 This gallery will immerse you in the obstacles experienced by the Allies – from the disheartening struggle amid the dense hedgerows, to the German counterattack at Mortain, to the major setback in Operation Market Garden. 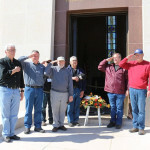 Exhibits also will recall a successful amphibious assault in Operation Dragoon. You will rejoice along the way as the Allies liberate Paris and finally push Germans back to their border. The Northern Europe: Breakout and Liberation gallery has been made possible through a generous gift from Jennifer and Phil Satre in memory of his father, Sam Satre. Both California natives, Phil and Jennifer met when they were students at Stanford University. Their parents were a part of “the greatest generation” and both of their fathers served during WWII. 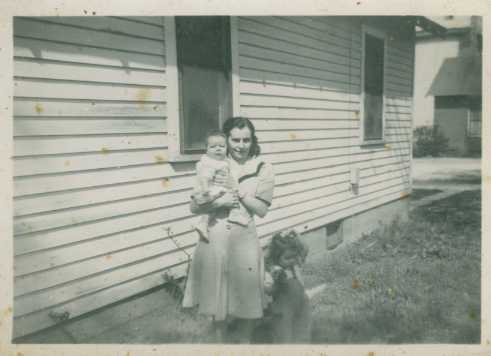 Throughout her childhood, Jennifer’s parents, Pat and Patricia Arnold, often spoke about the war. 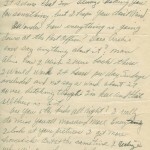 Having already graduated from college, her father joined the Army Air Corps 5 months prior to the attack on Pearl Harbor. He was first sent to Cal Tech University for training in meteorology and then assigned to the 12th Weather Squadron in North Africa. 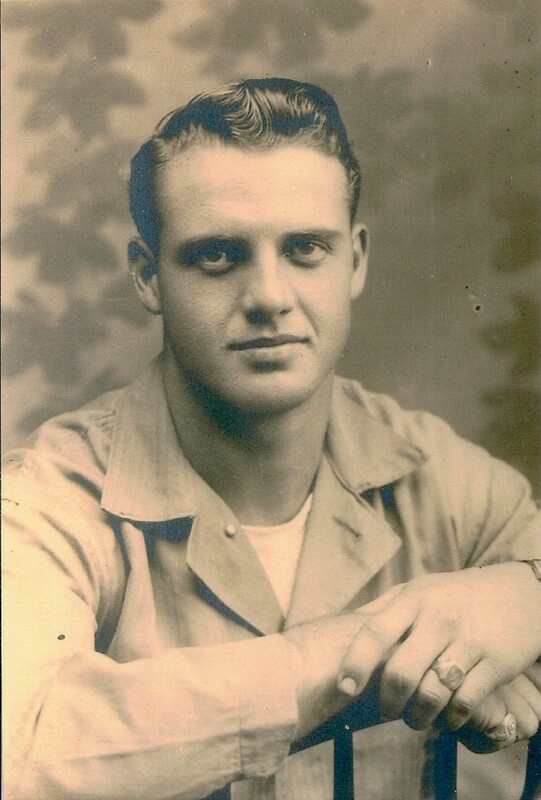 Jennifer says, “Mostly he talked about the wonderful camaraderie amongst the men and how much each soldier depended upon another.” He returned to the states and was decommissioned in the summer of 1945 as a major in the US Army Air Forces. 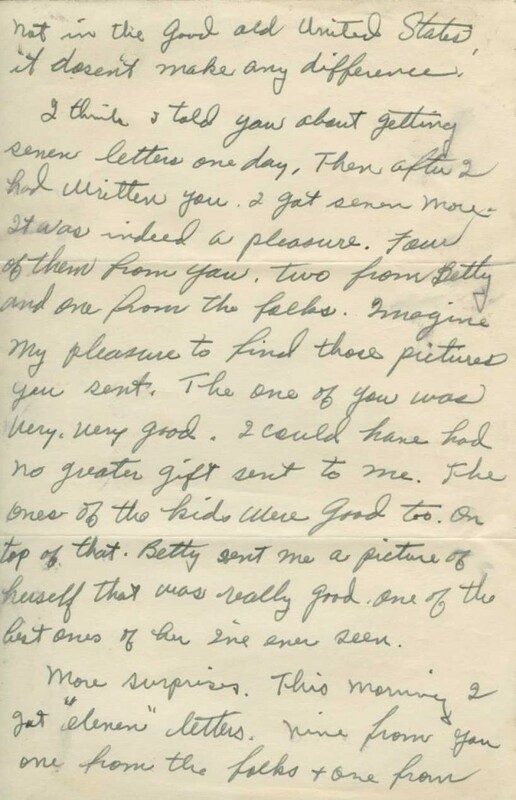 Sam Satre, a farm boy from Minnesota, met June Sterling in Menlo Park, California, while he was on leave from his service in the US Calvary in mid November 1941. 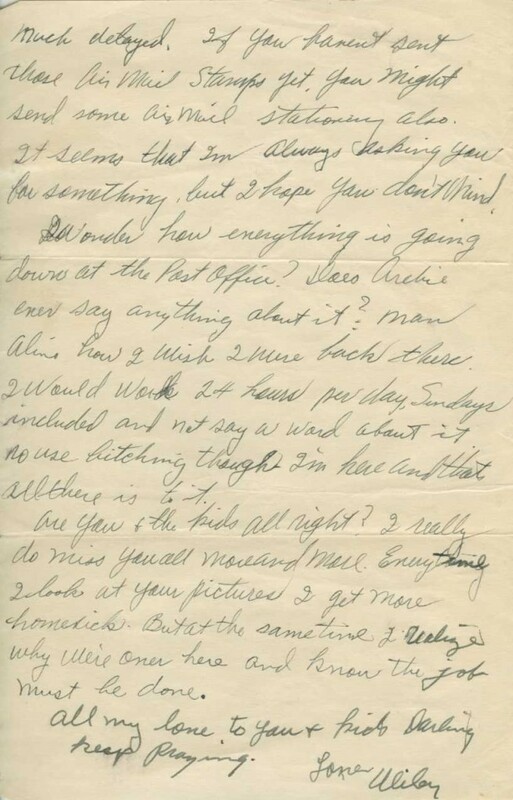 According to Phil’s mother, it was love at first sight and they were married soon after the attack on Pearl Harbor. 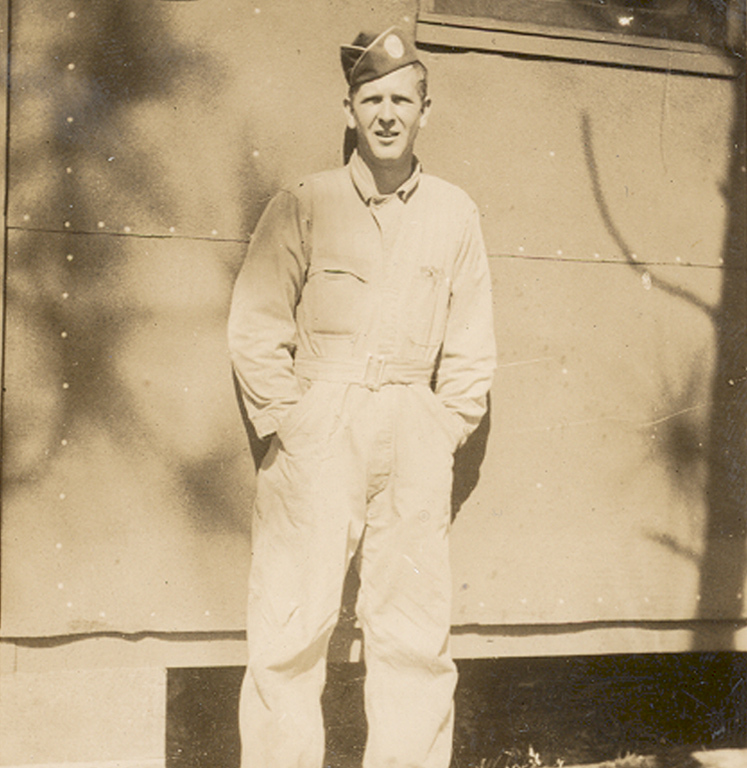 Phil’s father had been in the cavalry for two years when the US involvement in WWII began to gain momentum. The cavalry that he was a part of evolved into the 997th Field Artillery Battalion of the US Army. 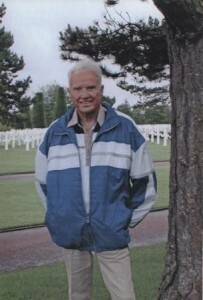 On the evening of June 26, 1944, Phil’s father landed on Omaha beach and participated in the Normandy Invasion. 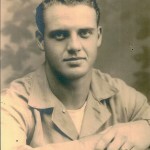 He also fought later in the Battle of the Bulge. After the victory in Europe, his unit was moved to Czechoslovakia to retrain for deployment to Japan. However, with the end of the war in the Pacific, he returned home in 1945 to California and enrolled at Stanford on the GI Bill. Phil was born while his father was in school. 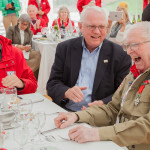 Although Phil’s father did not speak of his wartime experiences, this began to change when his father attended a reunion of his army unit nearly 30 years later. Prior to that gathering, Phil had never known that his father landed at Normandy. 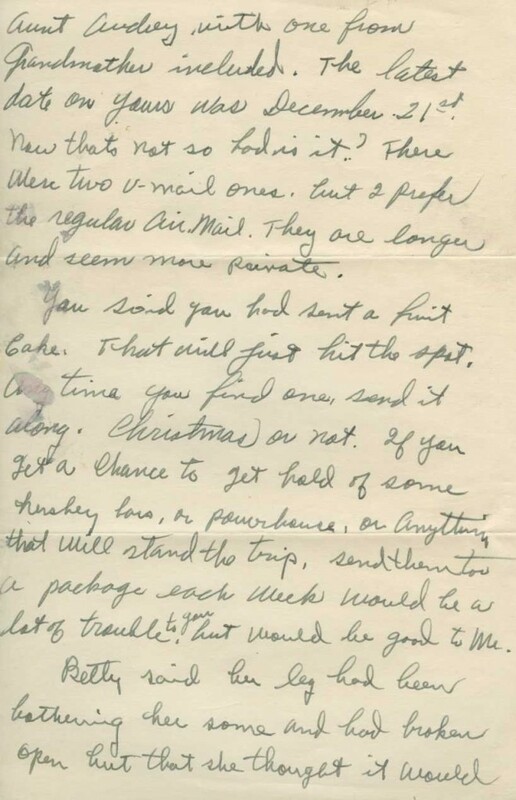 Jennifer shared that “Phil’s mother could write a book about what it was like to be a WWII bride with a child back home.” Phil’s mother followed his father around to all of his assignments until his unit went to England, and then stayed home and took care of Phil’s sister. 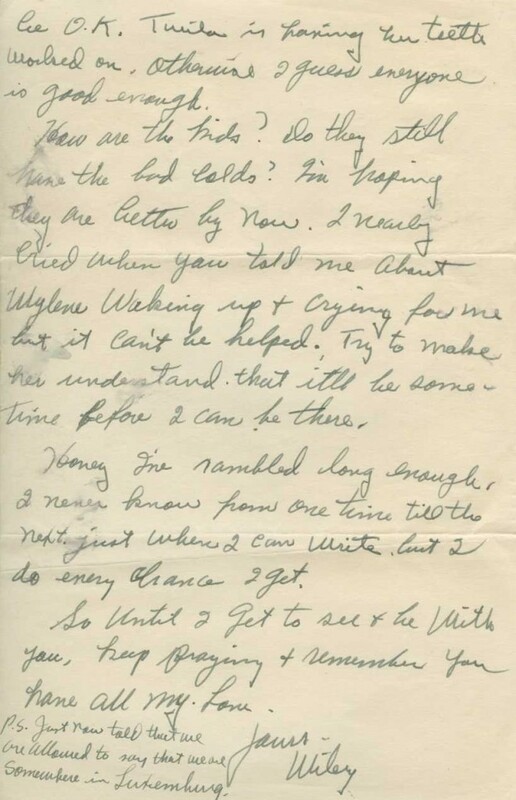 Phil’s mother still has all the letters Sam wrote to her while he was away. 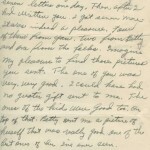 Phil has never read their letters, but Jennifer has. “All they say is how much they love each other. Phil’s father couldn’t say much more than that, so there is not a lot of information. 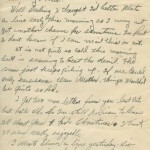 Just ‘I miss you.’” Phil’s mother turns 92 this July. Phil’s father also took part in the liberation of the death camps in Europe. 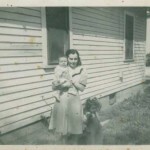 Phil still has photos that his father took during that time, which he describes as quite gruesome. He feels these photos “reiterate how awful that experience was and what liberation meant to the people that survived.” For those reasons, Jennifer and Phil felt it was a privilege and an honor to sponsor the Northern Europe: Breakout and Liberation gallery in Phil’s father’s name. Jennifer and Phil have also generously sponsored the Okinawa exhibit within the Road to Tokyo, the second floor Pacific Theater Galleries within Campaigns of Courage: European and Pacific Theaters. This floor is scheduled to open in 2015. They have named the exhibit in memory of two of Phil’s uncles, Gail Donald Sterling and Vern Patterson Sterling. 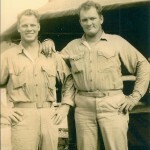 Gail and Vern enlisted together and both participated in the First Marine Division invasion of Okinawa. They both survived WWII and Phil knows that both of his uncles were very proud of their service in the Marines. When Phil and Jennifer saw that the Museum was building the Road to Tokyo, he wanted to acknowledge their role as Citizen Soldiers. There are two things that are crucial. One is that we believe that the mission of the organization is an important one. We have strong feelings about our parents and our families’ participation in the war effort, whether on the Home Front or in uniform. 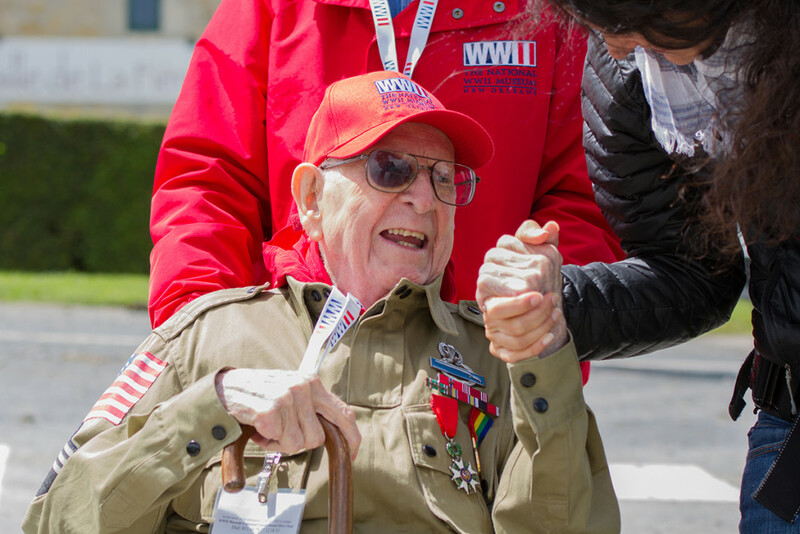 The need to have a Museum that tells the American Experience in WWII, the war that changed the world – why it was fought, how it was won, and what it means today – is something that resonated with us. Almost as important is a confidence in the leadership of an organization. The leadership means not only the Board of Trustees but also Nick Mueller and his staff and all of the people, including volunteers, involved on a day-to-day basis in operating the organization. 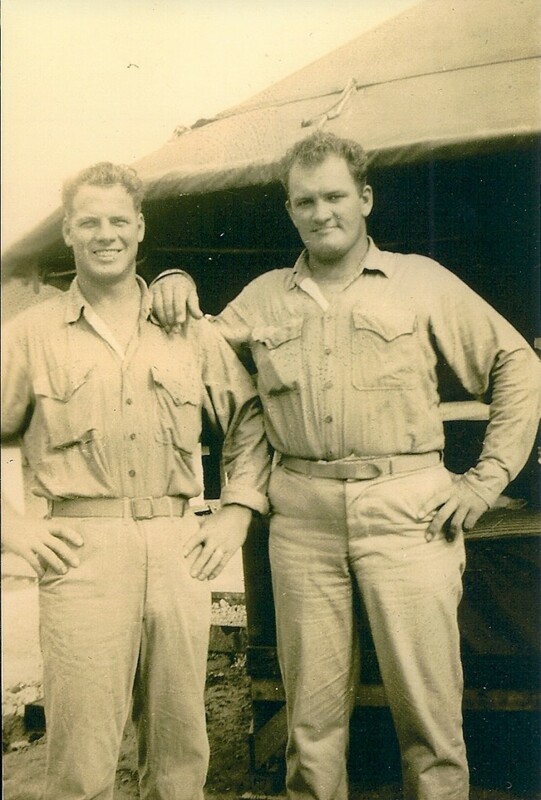 We always had confidence that they could execute the mission successfully because they had the work ethic and qualities of leadership to make The National WWII Museum a reality. ​I think that when you make a donation to an organization, you want to feel as good or better about that donation as the recipient organization. You should be happier than they are to be able to support them. We feel that way about the support that we give to The National WWII Museum.